Leon Reid faces a nervous wait to see if he can represent Ireland at next month's European Championships. The IAAF announced new rules on Friday which will see the ending of the total bar on international transfers, which has been in place for more than a year. However, it's not clear if the Bath-born sprinter's plea to switch from Britain to Ireland will be processed in time for him to compete in Berlin. The IAAF said attempts would be made to 'process applications quickly'. "We have a number of area championships coming up in the next couple of weeks so the transfer of allegiance review panel will endeavour to process those applications that have been held in the system as quickly as possible," said IAAF president Lord Coe. "But it is also important for me to note that no athlete should assume that they will be cleared under these rules automatically." Friday's announcement suggests that Reid, 24, will soon wear an Ireland vest, but whether his Irish debut happens at the European Championships remains in some doubt. In a short statement on Friday night, Reid said that he believed his application fulfils all the IAAF's criteria and that it would "hopefully be resolved in time for the Europeans". Reid applied last year to switch eligibility just before the world governing body halted all international transfers. The Bath-based runner won a Commonwealth Games 200m bronze medal for Northern Ireland earlier this year. One of the decisions taken at the IAAF's council meeting in Buenos Aires backed a recommendation from a review working group that there should be a "minimum three-year waiting period before an athlete may transfer to represent another member". Reid last represented Britain at the European Under-23 Championships in July 2015 so the three-year issue will not in itself prevent him from competing at the Berlin championships, which run from 7-12 August. Coe added that countries would also have to show that they are offering "full and permanent citizenship and associated rights" to athletes that do switch nationalities. The IAAF president said that those athletes who submitted applications before international transfers were halted will have to submit complete "new paperwork" and make a "declaration which will then go forward to the panel for approval or otherwise". Reid will be in action at this weekend's Irish Championships in Dublin. Reid's late biological mother was from Belfast although a difficult upbringing meant that the Bath native spent most of his childhood in foster care before he was adopted by a County Wexford-born woman. The sprinter has maintained close contact with his Belfast-based relatives in addition to making regular trips to Wexford to meet members of his adopted family. In February 2017, the IAAF halted all international transfers, pending a review, because of concerns over the number of predominantly African athletes switching nationalities to other countries. Last July, Reid wrote an open letter to Lord Coe in a last-ditch attempt to be cleared to represent Ireland at the 2017 World Championships in London but the plea was unsuccessful. After Reid's surprise Commonwealth Games medal in Australia in April, US great Michael Johnson called on the IAAF to grant the sprinter's request to run for Ireland. 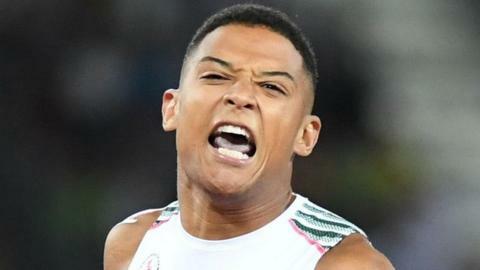 Reid crossed the line fourth in the 200m final on the Gold Coast but was promoted to the bronze medal after the disqualification of England's Zharnel Hughes for a lane infringement. Earlier this month, Reid cut 0.11 seconds off his previous personal best as he clocked 20.27 on the way to finishing third at the British Championships in Birmingham.